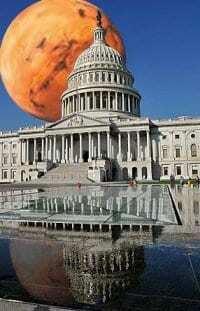 The Space Exploration Alliance (SEA), a broad and influential network of major space advocacy groups, including the Mars Society, the Planetary Society, the National Space Society and Explore Mars, will be holding its annual Legislative Blitz in Washington, D.C. from February 25th thru 27th. The March-on-Capitol Hill campaign will allow dozens of pro-space volunteers from across the country to meet with members of Congress and their staff in order to emphasize the strong bipartisan support for the U.S. space program and the need for an expanded human presence in the solar system. In preparation for the grass-roots Legislative Blitz, SEA staff members will hold an information-training session for registered participants on Sunday, February 25th, while scheduled meetings with congressional offices on Capitol Hill will occur on Monday, February 26th and Tuesday, February 27th. “As one of the founding organizations of the SEA, the Mars Society and its membership look forward to playing a lead role in advocating for a broad space exploration program that includes a clear direction and sustainable funding by Congress, with the goal of human Mars exploration,” said Michael Stoltz, Mars Society Director of Media & Public Relations. For complete details about the 2018 SEA Legislative Blitz, including how to register, please click here. Please note that early bird registration and pricing are available for those who sign up no later than December 31st.